“The benefit of improving the path and designating it a cycle route is to encourage more journeys by bicycle and on foot. This path finishes at the borough boundary and then connects to two paths in London Borough of Merton. Merton Council have recently up-graded their section of Green Lane to provide a good surface for pedestrians and cyclists. Figure 1: Plan of footpath between Green Lane and Trafalgar Avenue, Worcester Park, showing proposed improvements in two phases. From the plan/map it was clear that phase 1 (to be completed in 2014/2015) relates to the section of path between Trafalgar Avenue and Boscombe Road (a distance of approximately 365 metres), and that phase 2 (to be completed in 2015/2016) consisted of the remaining section from Boscombe Road to Green Lane at the boundary of the London Borough of Merton (a distance of around 500 metres). 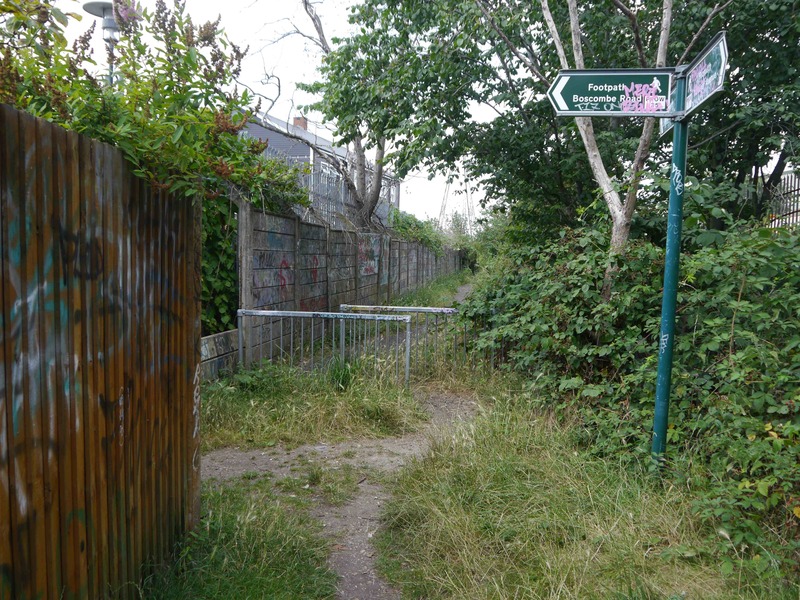 What was not evident, from either the letter or the plan, was the intention that the improved footway was to form part of a proposed end-to-end cycle route between Worcester Park and Sutton. This information only became apparent following research into the funding of the proposal. Photos of the eastern end of the footpath, by Charminster Road and Trafalgar Avenue, are shown in Figure 2. 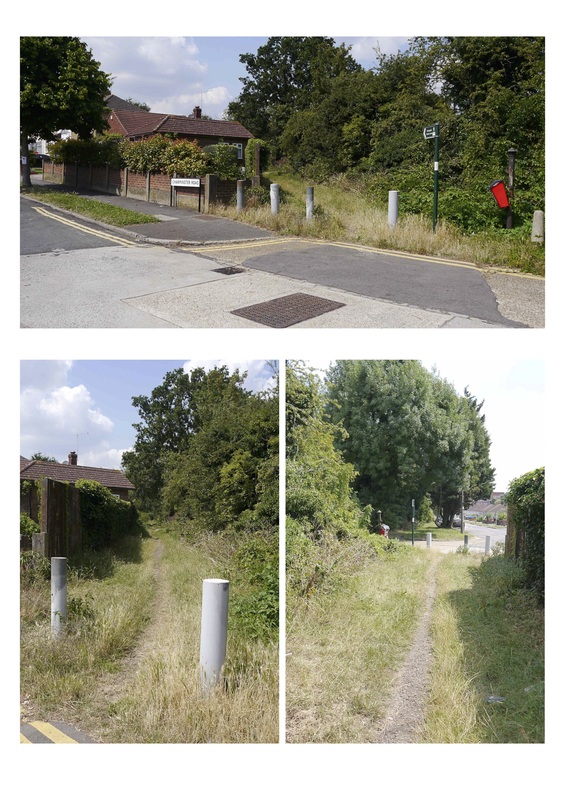 Figure 2: Three photos showing the Worcester Park footpath at its eastern end by Charminster Road/Trafalgar Avenue. Top and bottom left: view from Trafalgar Avenue towards the path; bottom right: view from the path back towards Trafalgar Avenue. The Transport Funding Bid document (Local Implementation Plan Funding 2015/2016), prepared for the Cheam North and Worcester Park Local Committee in July 2014, refers to part of the scheme (page 90) with the title “North Cheam to Worcester Park – cycleway”, and the description “Green Lane to Boscombe Road. Phase 2”. There is an indicative figure of £50,000 for phase 2 of the work, and this is listed under Programme 2: Corridors, Neighbourhoods and Supporting Measures (which has a total allocation of £1.267m), and not under Programme 4: Cycling Initiatives (which has an expected allocation of around £0.4m). Equivalent documentation outlining the indicative cost for phase 1 has not been found. However, given that phase 1 is a shorter section, a figure of slightly under £50,000 would be anticipated. Relative to the cost of widening a section of path over a length of about 200 metres in Carshalton Park earlier in 2014 for between £43,000 and £70,000, the costs associated with the Worcester Park path seem more modest. It is understood that there is funding available this year from the Local Implementation Plan 2014/2015 Transport Funding Bid for the phase 1 work. The same Transport Funding Bid document (on page 104) includes a Project Mandate Summary for the project, and it is this that indicates the improved footway would form part of a new cycle route linking the Sutton/Merton borough boundary at Green Lane with Sutton Town Centre and that this had been agreed by the Cheam North and Worcester Park committee. The mandate also suggests that the off road cycle route would increase cycling numbers, and encourage more journeys to be made by bike from the Worcester Park area. Get Sutton Cycling believe that there needs to be evidence of a bigger vision. When developing a section of route (such as this), plans for the whole route, particularly difficult junctions, need to have been formulated. This Worcester Park path needs to be seen in the context of the bigger picture. The path provides a safe environment for cycling, but will the rest of the route? Get Sutton Cycling are of the view that the proposed path upgrade, in isolation, is unlikely to meet the specified objectives of increasing cycling numbers or encouraging many more journey to and from the Worcester Park area. 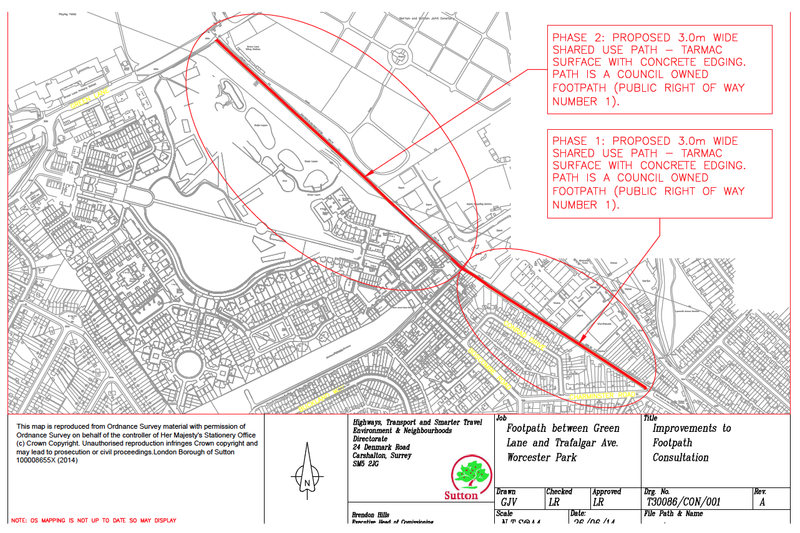 Reasons for this include: the lack of access/egress points; the fact that the path alignment does not provide a particularly direct route between Worcester Park and Sutton (although it is recognised that the Green Lane path does potentially provide a very useful connection for cycling between Worcester Park and Morden); the path is not to be lit; there are alternative, potentially better routes, that could be developed to Sutton; proposals on the access path to/from Boscombe Road have not been outlined; and the scheme is being treated in isolation – surrounding locations are not particularly cycle friendly. Money would be better spent on other improvements. these could include junctions across main roads, trialling a Dutch-style approach to residential streets, or endeavouring to establish our Worcester Park ‘ward ask’ to provide safe routes to schools. A ‘whole route’ approach is required. Questions remain as to the proposed alignment of this particular route between Worcester Park and Sutton. Where will it cross the A24 and the A217, for example, and what level of infrastructure is to be provided at these locations? Will crossings adhere to the new London Cycling Design Standards, will the route be direct, comfortable, feel safe, and be good enough to encourage many more people to cycle? These are all important considerations when bidding for funding from TfL, especially since the publication of the Mayor’s Vision for Cycling in March 2013 and the publication of the LIP guidance for 2014-2017. There has been some concern as to whether the path needs to be 3 metres wide. However, on balance, Get Sutton Cycling believe that 3 metres is an appropriate width for the tarmac path. With a width of 3 metres, the path will (a) provide a bold statement; (b) allow, over time, a level of vegetation to grow without compromising and restricting access too much (subject to periodic maintenance); (c) more readily complement the new upgraded Green Lane path in Merton (and be a similar width to the Pyl Brook path in Stonecot ward). Furthermore, the total space available between the boundaries of the path is, in general, greatly in excess of 3 metres, so plenty of green space will remain. It is not thought that any mature trees will need to be felled to facilitate this width of path, but should this be the case the path could be narrowed at these sections to prevent the loss of trees. The path needs to be smooth and flat. The surface should provide a better rolling resistance for cycling than available on the alternative carriageway. Drainage is also important, a flat surface will prevent puddles of rain water in wet weather and ice forming during cold weather – a particular hazard. Get Sutton Cycling would like all chicane barriers to be removed. These type of barriers currently exist by the access path from Boscombe Road (one pair on the main path (see Figure 3) and two on the approach path (Figure 4)), and near the borough boundary at Green Lane. Bollards would be more appropriate, although only when providing at least 1.2m separation between them to allow inclusive access for all types of bikes. The display of “Share with care” type signs, or pedestrian priority signs, would be recommended. Full and visible access required at the Boscombe Road entrance and the adjacent housing development (including chicane barrier removal). New designs to the path alignment at the Boscombe Road path/main path intersection (Figure 3) would be useful (not only to avoid 90 degree turns, but also slow cyclists on the approach). Consideration be given to opening existing track access to the path from Conrad Drive. To consider reopening the closed and disused Public Right Of Way linking Trafalgar Avenue/Charminster Road and Garth Road as shared footway/cycle-path (with no chicane barriers). To explore other options to provide improved access for walking and cycling to and from the industrial areas adjacent to Garth Road. Phase 1 of the path upgrade is scheduled to begin on 10 November. To enable this work, the section of path between Trafalgar Road and Boscombe Road will be closed on 10 November for a period of six weeks. Although lighting is not to be provided along the path initially, service ducts will be installed to facilitate a subsequent upgrade. In relation to what is happening elsewhere on the Worcester Park to Sutton route, the Council advised that they have written to Transport for London to request guidance on infrastructure options at the intersections with the A24 and A217. Construction of phase 1 commenced early 2015, completed late April or early May 2015. Notification that phase 2 scheduled to commence in February 2016. Notice of temporary closure of public footpath between the Sutton/Merton borough boundary and Boscombe Road from 22 February 2016 for up to six months. Notified that the path was, for all intents and purposes, complete at the Sutton Cycle Forum in June 2016. An article on this also appeared in our Borough News and Update newsletter the same month, available here (with the issue regarding the bollards rectified shortly afterwards). 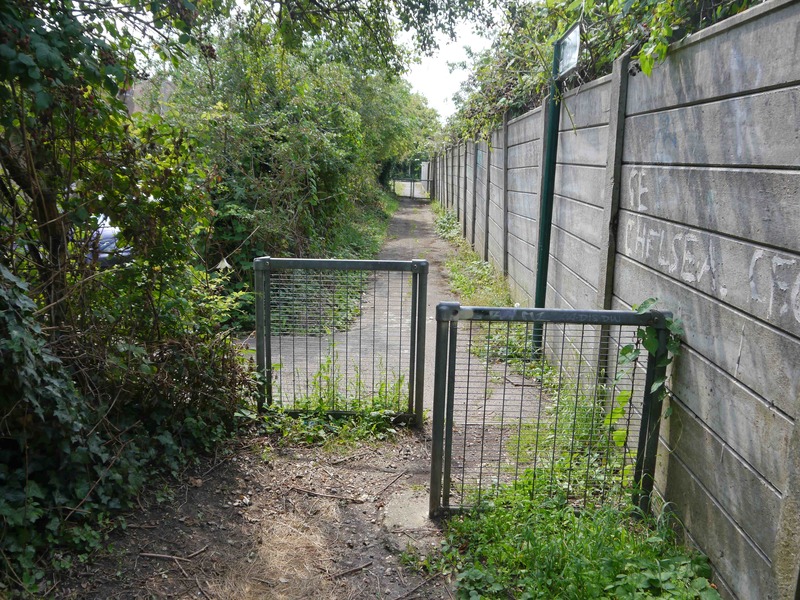 The path was again mentioned at the Sutton Cycle Forum in September 2016, with the news that the link from the northern end of the path towards Green Lane is to be upgraded in 2017-2018. It is hoped that the link to Boscombe Road (Figure 4) will be upgraded too.